It’s easy to find an excuse not to workout while you and your family or friends plan a vacation to an extravagant, relaxing getaway resort. It’s also easy to fall out of your habitual exercise regime since you typically won’t have access to much of the equipment you see in your normal, everyday gym. Vacations are exactly what the word means: VACATION! It is important to take time to relax and enjoy off time with your loved ones. You do not need to work out every single day; you also do not need to eat healthy every single day. As a personal trainer and fitness professional, I am telling you it’s okay to have fun and relax for a few of the days you are out of town, because life is too short to stress out about eating right and working out all the time. However, it is also important to consider planning a workout for the other half of your stay while you are out of town. That way when you do come back to REALITY, the transition of getting back into your routine won’t be as difficult since you didn’t fall too far off the bandwagon. The types of exercises I recommend you doing while you are away from your safe zone (aka, your gym) are variations of BODY WEIGHT exercises. You do not need any equipment, just yourself, which makes working out super simple and easy. I’m sure when it comes to planning a workout while you are away, the brain becomes a little foggy and it becomes difficult to think of dissimilar exercises to do other than squats and pushups. Yet, you’d be surprised how many more workouts you can get accomplished by just having yourself as the modality. 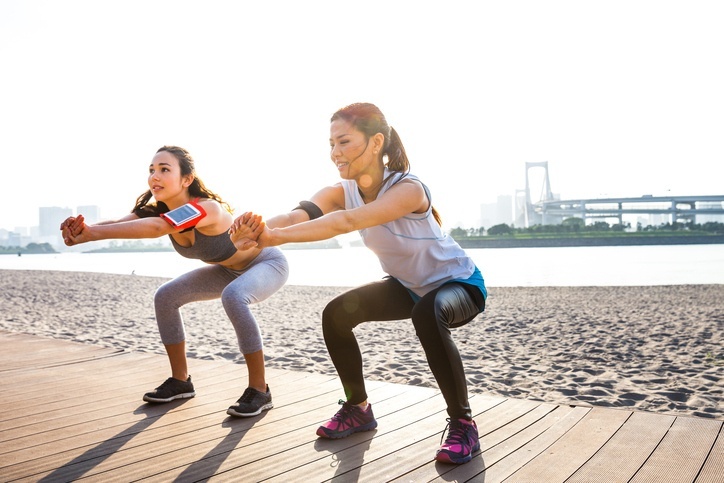 I am hear to build insight and help you get creative with your workouts while you are away so that you do not have to yield to just doing the most common/straightforward body weight exercises (i.e., squats and pushups). 1. CORE / ABS - When targeting your core, planks and sit-ups are great options for strengthening this region. But let’s get more creative. Throw in some side planks, add a hip-dip to those side planks, or rotate from your left your ride side. And lets add some flavor to standard sit-ups… try v-ups, bicycle crunches, or russian twists instead! 2. UPPER BODY - Now on to our upper body: the push-up. There are many alternative ways to “push-up” and work out our chest. Some of these exercises include: T-pushups (which involve additional rotation and activation of the abdominal muscles), diamond push-ups (which target more of our triceps), and plyometric push-ups or burpees (which will help to add a little bit of cardio to get our heart rates elevated). 3. SQUATS - Lastly is lower body exercises, or the squat. One of my favorite workouts to complete is pairing a dynamic move with a static move. For example, pairing a squat jump with a squat hold. This combination will certainly burn out your quad muscles while simultaneously elevating your heart rate and making you sweat. Tired of squats? Add some jump lunges to your routine, or some side lunges! Want to target your glute muscles? Hop on the floor and try double or single leg hip/glute raises. And if you are more of an advanced client, try to attempt a single-leg pistol squat for more of a proprioceptive/balancing challenge. Don’t be afraid to get creative on your vacation! Try changing some of those standard exercises into more complicated, but doable ones for a fun twist! Like what you see here, subscribe to our blog or follow us on social media!